Dendritic cells (DCs) play a key role in initiation of cytotoxic immune responses against pathogens and tumours. 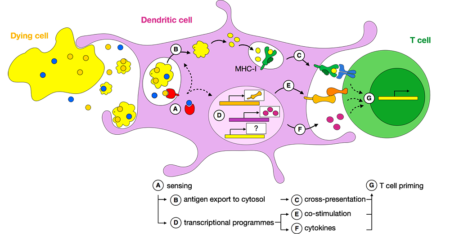 In order to prime the relevant T cells, DCs acquire antigens from infected or cancer cells and process them for presentation on MHC class I molecules (Figure 1). Figure 1. Antigen cross-presentation and initiation of cytotoxic immune responses by dendritic cells. We are interested in the signalling events, membrane trafficking pathways, and transcriptional programmes that control processing of captured antigens and the efficiency of T cell priming (Figure 2). We employ proteomics, transcriptomics and CRISPR-Cas9-based genetic screening strategies to identify the players involved and to build a detailed picture of the molecular events that occur in DCs following antigen uptake. Figure 2. 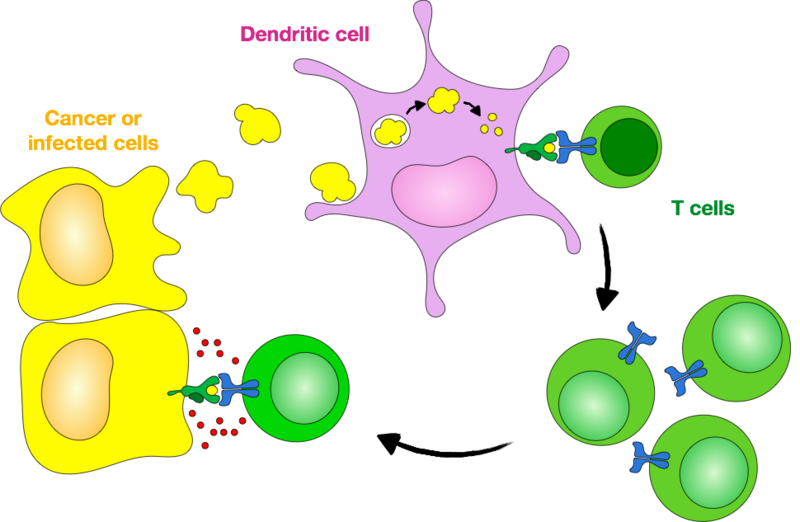 Intracellular events in dendritic cells that follow antigen capture. We also aim to understand how intracellular membrane trafficking and signalling pathways are modulated by danger signals associated with viral infection or tumour environment. These signals regulate the efficiency of antigen processing as well as expression of co-stimulatory molecules and, ultimately, determine whether the DC-T cell interaction results in an immunogenic response or, conversely, promotes tolerance. In parallel, we seek to use the knowledge of DC biology to identify novel immunotherapeutic strategies that could elicit potent and long-lasting tumour-specific immune responses.